The Ricoh MP-3054 is a monochrome multi-function printer that includes a print, copy, scan and fax function. Designed to increase the security and efficiency of busy workplaces, it also incorporates money saving features without compromising on quality. This no frills printer is a versatile device, with options to suit the individual needs of the workplace, and can adapt to the changes in business. However, this is a monochrome printer only, so it will need to be used alongside other devices to meet all printing needs. The Ricoh MP3054 comes in a grey design and measured 587 x 680 x 913 mm. On the top of the printer is a 100-sheet automatic document feeder for ease of scanning and copying. The paper tray holds 550 sheets, but this capacity can be increased with additional paper trays up to 4,700 pages. The printer can be controlled from smart devices or using the easily customisable 10.1-inch touch screen operation panel. Printing speeds are up to 30 ppm, the monthly duty cycle is 20,000 pages and print resolution is 600 dpi. Connection is achieved via a USB, an Ethernet, or from a smart device. 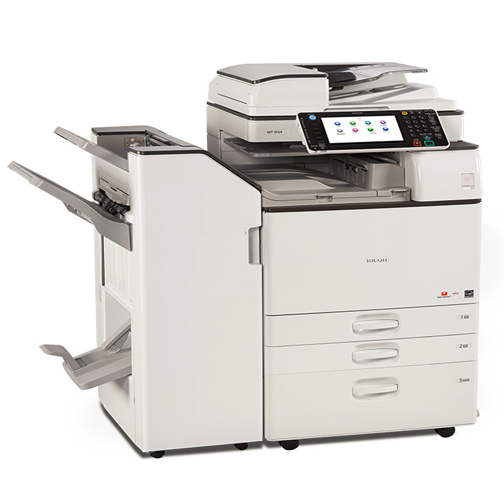 This is a versatile printer that works well in modern workplaces, with apps and Near Field Communication technology allowing the Ricoh MP-3054 to be controlled and share information directly from a smartphone. Energy saving features and recyclable parts and consumables make this printer better for the environment. Choose options to fit in with the changing needs of the workplace, such as increased paper storage and finishing options. Security features ensure sensitive information is protected. The Ricoh MP3054 is a monochrome printer only and is designed to be an addition for the workplace, rather than the sole printer. Many of the features of this printer are optional extras and should be factored into the cost before purchasing.